The stuffing’s on the outside of this turkey! A crust of corn bead crumbs and rubbed sage coats the turkey to seals in the juices and give it savory flavor and crunchy texture. 1. Place oven rack in lowest position. Preheat oven to 325Â°F. Place roasting rack in shallow roasting pan. Mix Corn Bread Crust ingredients in medium bowl. 2. Rinse turkey; pat dry. Mix oil and orange peel. Brush on turkey. Coat entire surface of turkey evenly with Corn Bread Crust mixture. Place turkey, breast-side up, in prepared pan. Cover loosely with heavy duty foil. 3. Roast 2 hours. Remove foil. Roast 1 to 1 1/2 hours longer or until internal temperature reaches 165° F (175° F in thigh). Remove turkey from oven. Let stand 20 minutes. Transfer to platter or carving board and slice. 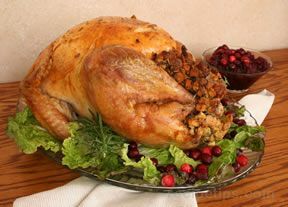 Serve with Sage & Citrus Perfect Turkey Gravy, if desired.Sage & Citrus Perfect Turkey Gravy: Mix 2 packages McCormick® Turkey Gravy Mix, 1/4 cup flour and 1/2 teaspoon McCormick® Rubbed Sage in large saucepan. Gradually stir in 2 cups water, 1 cup turkey pan drippings and 1 tablespoon orange or lemon juice with wire whisk until smooth. Stirring frequently, cook on medium-high heat until gravy comes to boil. Reduce heat to low; simmer 5 minutes or until thickened, stirring occasionally. (Gravy will continue to thicken upon standing.) Makes 3 cups.